You have visions of homegrown tomatoes dancing in your head. . . Homemade tomato sauce canned and stacked neatly on shelves, stewed tomatoes in jars, tomatoes on salads and just taking a big juicy bite out of one straight out of the garden – you can almost taste it! You go out to your garden to do your checkup and daily watering and see something odd on one of your tomato plants. The leaves are watery and rotten looking and there is a brown lesion on the stem. What is going on? You guessed it: you may have tomato blight. 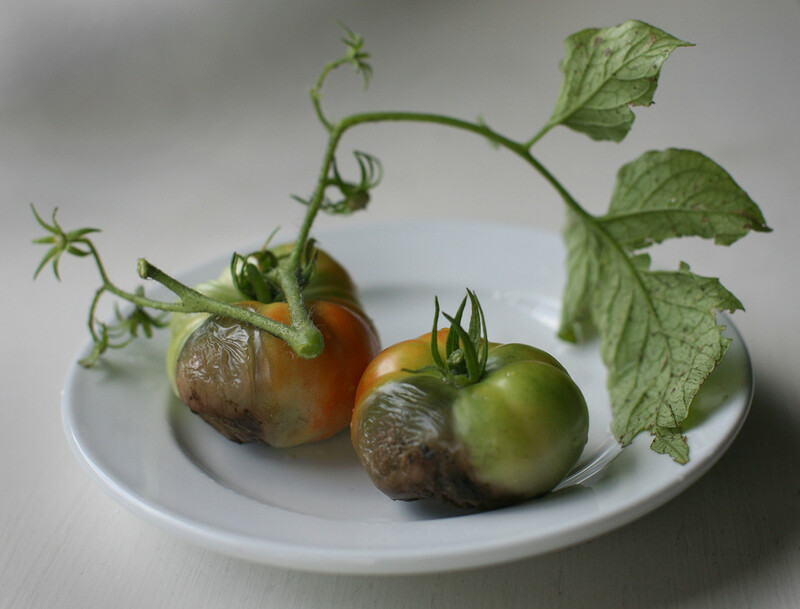 Early tomato blight is caused by a fungus called Alternaria solani. This fungus can affect almost every part of the tomato such as the stems, leaves and fruits. It may not outright kill the plant but it will weaken it and the yield may be smaller. Early blight loves damp weather and heavy dew, it can be in the soil, or it can overwinter in diseased plants from the year before if you didn’t clean up the vegetable garden promptly. Like with most pests and diseases, plants which are stressed or just in plain poor health are more susceptible. Early tomato blight forms spots on the leaves, which then turn yellow and die. The spots may start out small and shrunken and as they get bigger they get longer. Spots which are on the stem near the ground can cause the stem to girdle. When it’s on your fruit, the spots show up near the stem. The spots will be dark leathery and sunken with concentric rings and it will affect your ripe and unripe tomatoes. Your plants may survive this attack but there won’t be as many tomatoes. While early blight is a nasty disease, it’s not as devastating as late blight. Late tomato blight is just plain bad news all the way around. The name of this fungus is called Phytophthora , which means “plant destroyer”. It can ruin a whole crop and infect other plants quickly. It’s highly contagious and can spread from your garden to a neighboring gardener’s plot in the breath of a spore carrying wind. If a plant becomes infected, it has to be destroyed and taken off-site (not composted). Late blight shows up as blue-gray spots which then turn brown, and it affects both the leaves and the fruit. The fruit will have brown greasy spots which are shaped irregularly. The spots on the leaves and fruit may have a cottony looking ring of white mold and the leaves will eventually fall off. Late tomato blight shows up in cool and wet weather in mid-to-late season and can kill a plant within a week. California’s Humboldt County and the coastal Pacific Northwest has such cool, damp summers that our tomatoes often suffer from blight – though it’s by no means limited to the Northwest region. Gardeners across the country suffer from both early and late blight. The heartbreaking look of late blight. If you can find grafted versions of tomatoes that are bred for disease-resistance, all the better. Grafted tomatoes can be much more vigorous and better able to shake off stresses. First of all buy your starts and seeds from a reliable source – don’t just take starts off friends or well-meaning neighbors. Make sure there is enough space between your plants for air circulation. Add a layer of mulch or use those red plastic tomato mulches they sell as a barrier between tomato foliage and soil, as the fungus can be carried in the soil. Check your plants frequently during wet weather or if they are stressed. If you see anything that even remotely looks like blight, begin a spraying program of alternating organic copper spray, and Serenade biological fungicide, both of which are safe to use on edibles. Don’t spray them together on the same week as there is some question as to whether the copper inactivates the Serenade. Do use caution with the copper – spray early in the morning to avoid harm to bees, and because it can build up in the soil and cause toxicity, don’t grow tomatoes in the same spot every year if you’re going to use copper frequently. Make sure your garden area is cleaned up promptly at the end of the summer gardening season and there isn’t any plant debris lying around. If you have an outbreak, rotate your crops even if you have to plant in containers. Don’t overwinter your plants and remove any volunteer tomatoes and potatoes that come up. Potatoes can carry blight too. Use trellis and plant supports to keep your plant branches off the ground, and as noted above, use mulch! Don’t water your plants from above, and water early in the day so your plants are dry by nightfall. A product called Actinovate, which has the beneficial bacteria Streptomyces lydicus in it, can be used as a preventive measure. Oxidate, made of activated peroxide, is another safe and effective product to keep plants sterile and clean of blight. However, the above methods are for prevention. If late blight shows up, you need to pull out all the plants which are affected and put them in a trash bag. Don’t compost them as this highly contagious disease can infect the rest of your plants, and even your neighbors’ plants! While in cool, moist climates, tomato blight can’t be totally beaten, by using preventive measures you can go a long way towards reducing the likelihood of outbreaks. Linda Ruzicka has been gardening since she could reach her grandmother's knees, and now gardens with her own granddaughter, along with her three dogs. She loves attracting wildlife and butterflies, and her last garden was certified as a Backyard Habitat. Great timing! I was just in the store the other day and saw chemicals for tomato blight, and thought what should I do if I run into this problem ? (as this year is my first experience with Organic vegetable gardening.) Now that you have armed me with the knowledge I have one less thing to worry about. 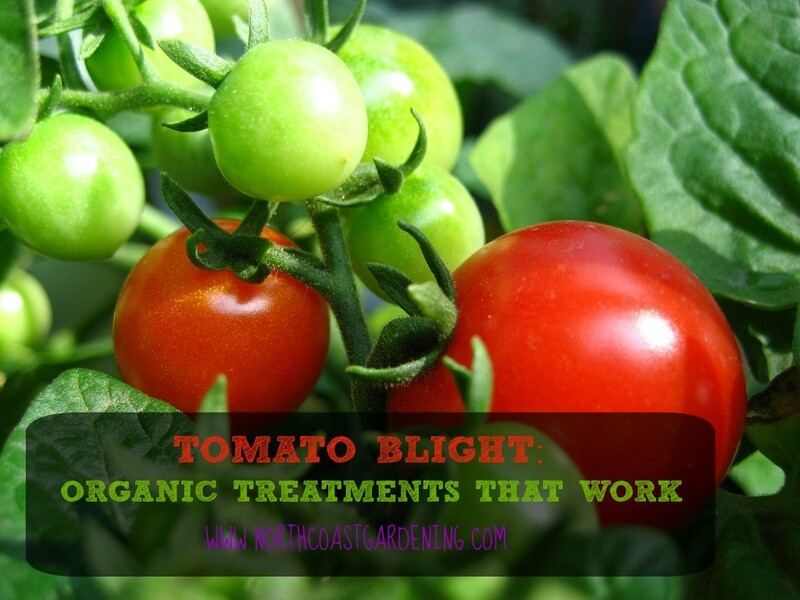 Yeah, if you’re growing tomatoes in a coastal or humid area, you definitely want to try to prevent blight. It is such a heartbreaker! I lost a lot of my tomatoes to late blight last year – in fact, most everyone in this area did. So these tips will come in handy if history repeats itself this year. Yep, in my area, too – many of my friends have sworn off tomatoes, but – sungolds! Fresh garden sungolds! Hard to swear off nature’s best summer candy. . . Thank you for the information on organic treatments. I have to be extra careful now that I have bee hives. Thanks for the tips. I hope you can help me. but I don’t know if it’s de best option. What u can tell me about it? Last year i limped through the season. We had tomatoes, just enough to keep on table and then some. This year i have went to a new spot that i planted in. Hoping this will be the answer for our canning needs. I use cow dung for most of my crops and me manage to save tomatoes from blight in recent years. It is best to use simple fertilizers in tomatoes. My tomatos whether in greenhouse or outside look really good until they get to about the third set of blossoms and then the new growth just doesn’t develop very well. The leaves stay curled and small. If I cut the new portions off, the older portions develop almost normally and the fruit grows and ripens. Looking on line at the symptoms for early and late blight they just don’t fit. Have tried copper spray to no avail. At 78oo ft. in Colorado.